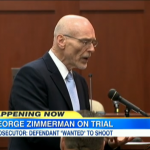 Yesterday, the opening states of the George Zimmerman Trial took place. The defense is trying to paint Zimmerman as a man who was threatened and acted in self-defense, whereas the prosecution is trying to paint him as a vigilante. Today, Dan appeared on Good Morning America to discuss the way that both sides handled the opening statements. He comments, “There’s a way for you to present this case and say, he was right, he was entitled. He shouldn’t be prosecuted. But to say, thank god, I think there were two, main points with that joke and those words that could stick with these jurors in a very, very dangerous way for the defense. And quickly, today, prosecutors are going to try to convince the judge to allow nonemergency calls that zimmerman made to be played in court. They want to show a pattern. This is a guy that called 911 all the time. He was always angry. He was always thinking that there was someone out there. And they think that that’s relevant to his state of mind.” Watch the segment here.